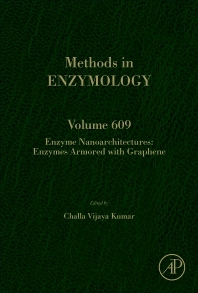 Enzymes Conjugated to Graphene, Volume 609 in the Methods in Enzymology series, highlights new advances in the field, with this new volume presenting interesting chapters on Enzyme immobilization, Detection of Urea, Enzyme immobilization Enzyme immobilization, PAMAM dendrimer modified reduced graphene oxide post functionalized by horseradish peroxidase for biosensing H2O2, HRP immobilized for LEV detection, Enzyme immobilization, Graphene biocatalysts, Enzyme immobilization, Interactions, Enzyme immobilization, GQD, Enzyme Immobilization, and Enzyme immobilization on functionalized graphene oxide nanosheets. Challa Vijaya Kumar, PhD is a senior professor at the University of Connecticut and has more than 40 years of research experience in interdisciplinary research areas including biological chemistry, physical chemistry, organic chemistry, photochemistry, biochemistry and material chemistry. He has more than 158 peer-reviewed publications and several book chapters in internationally reputed journals. He has been actively working in the area of bio-related two-dimensional materials for nearly 25 years and has published 10 papers on graphene related topics in the last 3 years. More importantly, his research lab pioneered the synthesis of graphene in aqueous conditions using proteins as exfoliating agents.